1. What can I do to keep them warm when they come April 11th? Last year I killed them (froze after I put the sugar water on them). Clearly I will not spray them with sugar water if it is below 45 degrees, but any other suggestions to keep them alive? 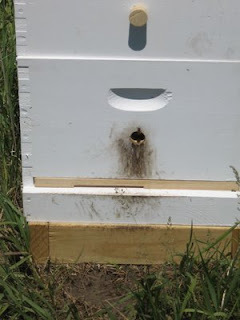 If you have some drawn comb when the bees come, at the time of installation you can spray sugar syrup into the cells of two frames. You don't have to fill the frames but spray the edges and along the top cells. You will feel the frames gaining the weight of the added syrup. 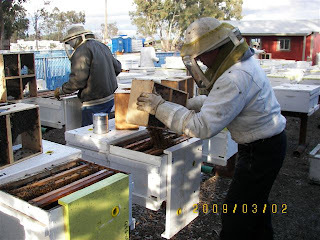 After you put the bees in add these two frames to the center of the single deep box under the feeder pail. This should give the bees ample food to immediately produce heat to keep themselves warm. You can do the same thing with frames of honey. 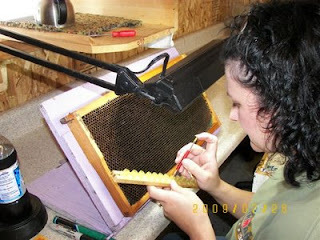 You should scratch open the sides of the frames with a capping scratcher exposing honey. 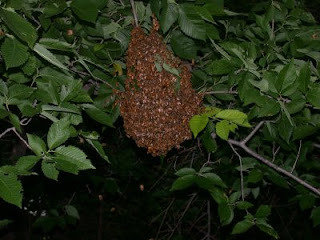 The bees will have immediate food and can produce heat. Even if it is in the 30's. This colony is weak. It is only about 3 frames of bees. It is a MN - Hyg queen. This may not be able to build into a decent colony. 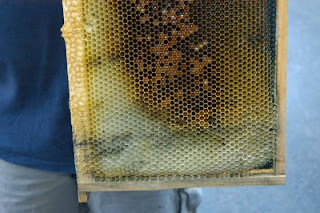 I will add a frame of capped brood from another colony on the next warm day. The colony shown here again is a MN - Hyg queen. About four frames of bees maybe. It is a little weak but pollen patties and a little syrup might bring it around. If these two colonies were Carniolans, I would have more faith in a positive turn around. This colony again MN - Hyg queen. It is much stronger than the previous two. 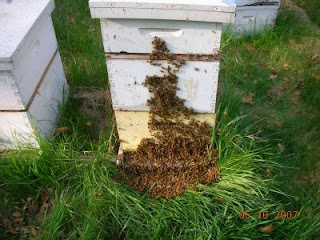 Pollen patties and a little syrup will have this colony bursting at the seams by mid May. The other two were also given pollen patties. Pollen substitute is critical to getting a colony to proper strength for Late spring divisions. I still have package bees available for my second load. A day in the bee yard. 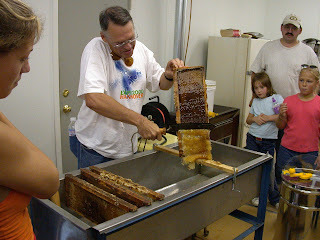 Master beekeeper Bob Sitko teaches a beekeeping class at Century College. His class starts in Jan once a week for 6 weeks. His class includes a trip to his bee yard. 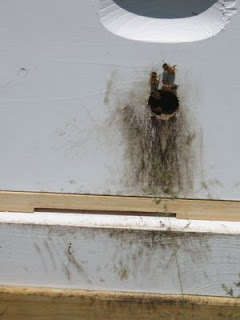 The video from Terry McD and posted with her permission shows two hives and how they compare. Terry works hard on the editing to make this a great springtime video. A late winter question from a beekeeper. Nice frame. Food and room to lay for the queen. This was a new frame last year. The upper corners are nice and white. 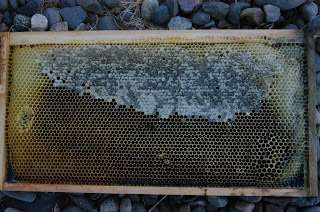 Brood comb where the brood is being raised will turn dark brown with time. This is normal. 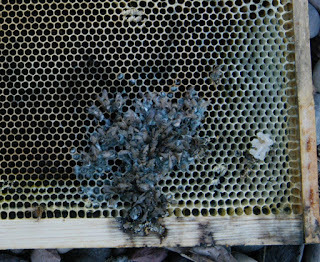 The dark color comes from brood debris that gets embedded in the wax. Brush off the dead bees. The bees will clean up the rest. A little mold, the bees will clean it up. Notice the pollen in the cells. ( Brown muddy looking) The bees will need this to build up the brood. > I don't mean to take up your time but we could use some advice. > We checked the hives again today - first time since January. > hives are absolutely full of bees. > swapped the top and bottom box and put in the queen excluder. > they would move up there and clean that box up. > whole colony to get sick from it. No queen excluders until you are going to divide. You need 8 - 10 frames of brood (bees in all stages, eggs. larvae and capped) to be able to divide a colony. Most divides happen in May. I will have queens available May 1st. There can be a rare occasion the a hive is so full that they have to be divided a little early, if you absolutely have to divide in late April, I may have a queen for you. 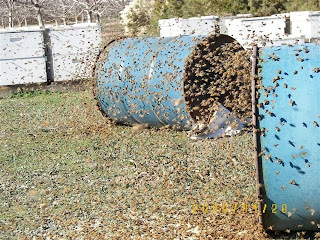 The hives will unlikely swarm this time of year. The dead bees on the bottom board is normal. The bees will clean up that mold. Brush off the dead bees off the frames the bees will clean up the rest. Your frames look fine. The nice white new combs will get darker with time and will end up a very dark brown. This is normal. Make sure the bees have enough feed. They will use more during brood rearing. Don't overfeed. Just enough to keep the going. It sounds like you did a reversal. Maybe a little early, but if it is loaded with bees you probably are ok. If the hive isn't boiling with bees I would hold off on reversals for a week or so. On a three deep hive for a reversal I like to move the bottom box to the top and move the top two boxes down leaving them in the same order. FAQ What load of bees am I on? I have two loads of bees coming. April 11 and April 25. The second load is a smaller load, added after the first one was almost sold out. Everyone who is on the second load is getting an e-mail or phone call to let them know they are on the second load. No e-mail or phone call you are on the first load. If you still are unsure e-mail me and I will tell you which load you are on. Terry McD has a new video. 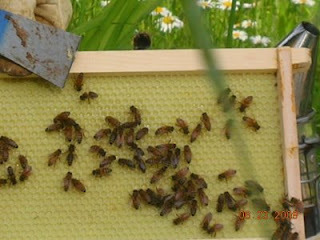 A short video of a hive on the first warm day when bees can work from the bottom board. 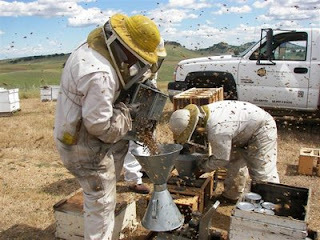 They are busy cleaning out the hive of dead bees. Lots of activity at the upper hole where the brood is. 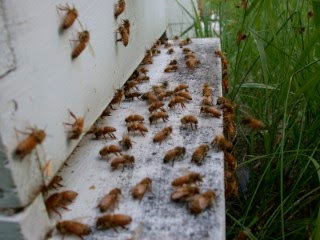 The bees are enjoying the pollen patty that is helping them feed the brood and expand the hive population. The queen cell building yard is full of bees. The grafted queen larvae are moved to these cell builder colonies. They are strong queenless colonies that need a queen. So their desire to make queen cells is great. Starting a queen cell building yard. This latest cold snap could be a colony killer. 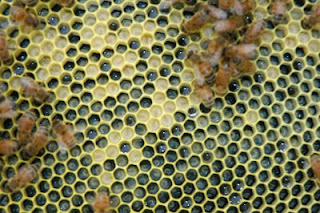 Most colonies have brood in the hive. If a colony is caught with very little honey around the brood, starvation can occur. The bees will not leave the brood to retrieve honey. If honey is a frame away they may not be able to get it. The first series of queen grafting has started. The pen like tool is called a Chinese grafting tool. It has a spring mechanism like a pen. The head is pushed down exposing a plastic "tongue". This tongue scoops up the larvae and royal jelly from the cell. The tool is put into the queen cup. Letting off on the head of the tool retracts the tongue and the larvae is deposited into the back of the queen cup. Pollen patties have been on for over a month already. Feeding syrup is going strong. 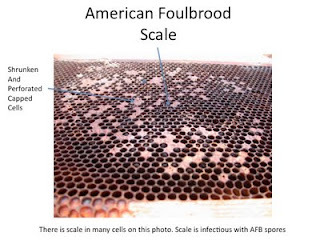 All of this helps spur brood production and the raising of drones for queen mating. 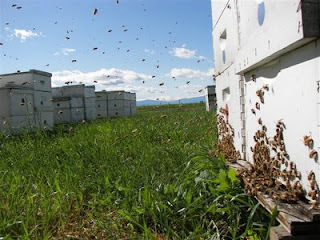 Right now grafting has begun to raise queens for the spring season. 24 hour old hatched larvae is scooped out of a cell and transferred to a queen cup. Feeding 1:1 syrup with a pail feeder. Notice the stick. 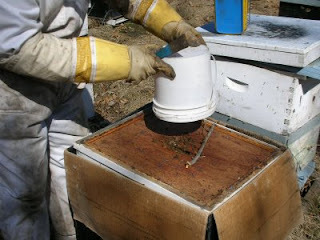 The hive was not level so I shim the pail so it won't leak out. Pollen patties are a welcome addition to a bees diet. MMMMMMMMMMMMM good. Leave the wax paper on both sides to keep the patty fresh. The bees will chew it up. The weather appears to be heading for a swing to warmer temperatures. 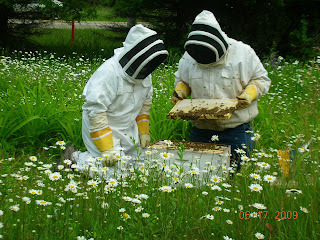 This coming weekend looks good for a hive check. Now a look to see. Dead or Alive. 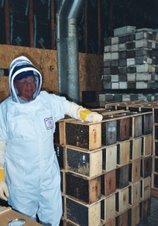 The need to know is getting important so package bees can be ordered to fill dead colonies. Syrup can be fed as it warms up. 1:1 sugar syrup is the mixture for spring feeding. Syrup treated with Fumigilan to help prevent Nosema Apis and Nosema Ceranae. A word of caution about feeding. It is important not to feed pail after pail of syrup. 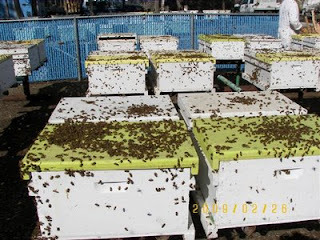 A strong overwintered colony will put it away in large amounts. Later when the dandelions come out the whole hive can become honey bound. Leaving no place for the queen to lay, Causing dwindling and no honey and a weak colony. It is better to watch the syrup intake, making sure there is at least a few frames of food, not a smorgasbord. If the syrup is on it is also time for pollen patties. 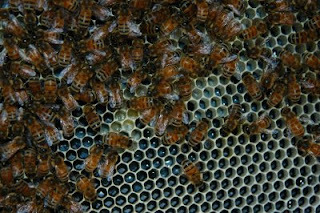 Pollen patties are essential for colony growth if there is no pollen in frames or natural pollen available. Pollen put on now makes a colony strong for divides in May. Failure to give pollen or pollen patties will make a colony lag and the population will suffer. The added nutrition can possibly help keep nosema ceranae at bay.